Happy Wednesday, we’re closer to the weekend and trying more vegan burgers for The Great Sacramento Vegan Burger Battle. I can’t wait! And I got three fast-food loving co-workers to try the vegan burger offerings from Zest Kitchen for lunch today with rave reviews. Hopefully they will continue to try more around the area. 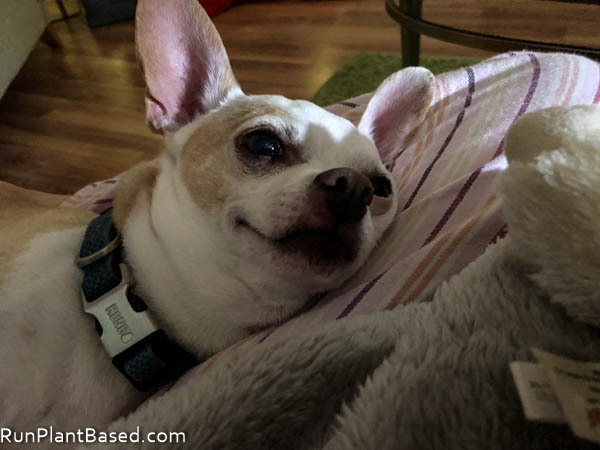 Tonight we’ll be chilling with this guy watching more Parks and Recreation or Lost in Space on Netflix. 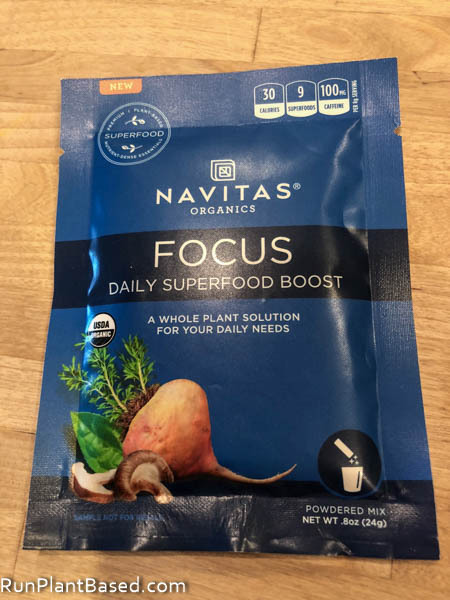 I scored packets of Navitas Organics Focus Superfood Boost powder from Eat Drink Vegan and have been trying them in smoothies this week. It has lucuma powder, maca powder, cacao powder, mushroom powder, acai powder and more in a fine powder format with no additives. It doesn’t add amazing flavor to smoothies, but that’s what frozen bananas and strawberries are for. It does add an impressive blend of superfoods to make it more of a power smoothie in a simple powder blend, much faster than adding separate spoonfuls. 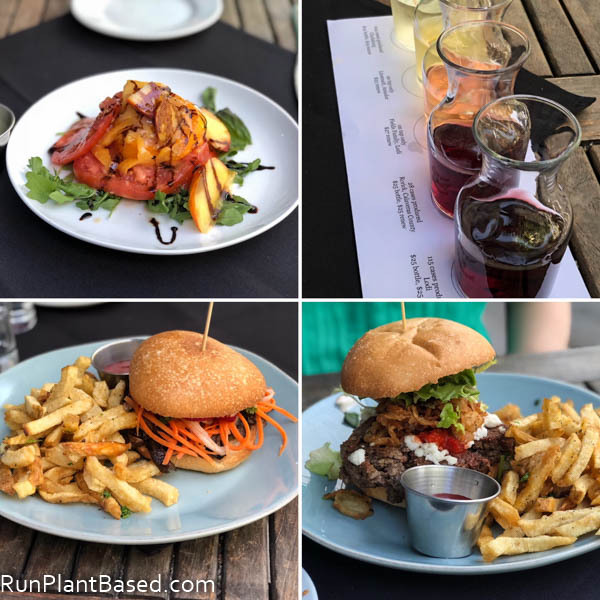 Sunday we stepped out to Revolution Winery + Kitchen to try their vegan burger offerings and do a little wine tasting. We got the heirloom caprese with Miyoko’s cheese to start and tried the Bahm Mi oyster mushroom burger with picked veggies and sriracha aioli and the Impossible Burger with Miyoko’s mozzarella. Both burgers were awesome while being very different, I really liked the texture of the mushrooms and addition of the tangy pickled veggies in the Bahm Mi. And the Impossible burger seemed so much like a real diner burger it was freaky and awesome. There were also plenty of other vegan items on the menu to choose from with a nice patio, we’ll be going back soon. 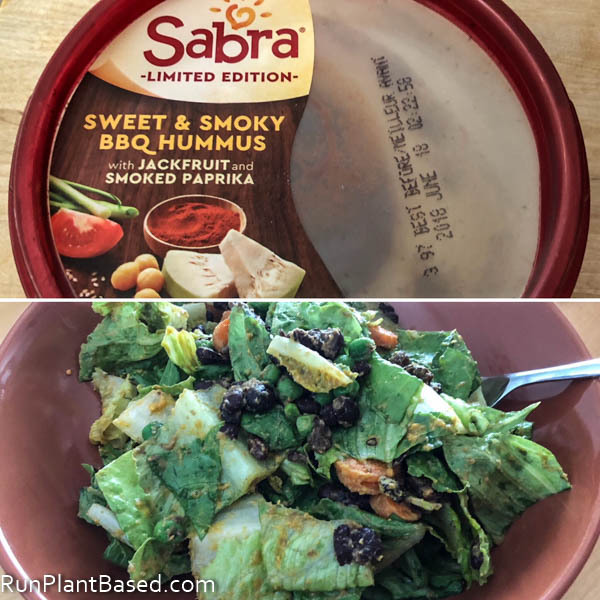 I had an interesting hummus find at Grocery Outlet this week – Sabra Sweet & Smokey BBQ hummus with jackfruit. By itself it’s delicious, there is jackfruit in the BBQ topping to mix in and it adds a “pulled pork” texture. 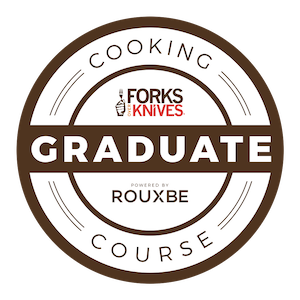 I threw a blob into the blender with a carrot, nutritional yeast, and veggie broth to make a fun dressing for a romaine and black bean meal salad – it was delicious too with a southwest BBQ flare. 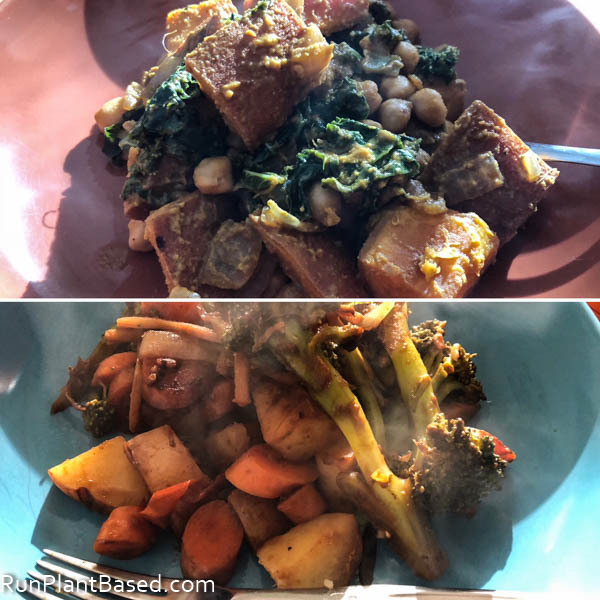 Other simple eats this week included more oil free veggie sautes and stir fries, a fun curry stir fry with kale, chickpeas, and sweet potatoes. And broccoli saute with potatoes, tofu and carrots seasoned with a sweet and spicy chili sauce. Not gorgeous, but fast, simple, and healthy for weeknight meals and lunch leftovers. I need to get some of that Focus powder for smoothies! We love smoothies here and it has been far too long since we’ve had a smoothie. Hummus with jackfruit! Now that’s impressive and innovative, I’m surprised to see it made by such a big manufacturer. Hopefully it’s at my local GO… I might need to check today. Yes, I was excited to find it and it’s delicious. Also found chocolate brownie dessert hummus that’s great in smoothies. Yum! So many delicious meals this week. I can’t wait to hear about all of those burgers. Yes, have more to try this weekend and drooling looking at all the social media pics from this challenge!